What is the “53” block? 1. Brazilian Blocks are cast by a company named “TUPY” and are marked such. They are identified with cast evolution numbers. #53’s are TUPY’s. #54 and later evolutions were improved to correct the block issues that the 53’s had. 2. Mexican Blocks were made by “Teksid” these blocks to my knowledge never had a problem with cracking, as they are heavier duty by trait, but they did follow the evolutions and got thicker. These blocks do not have the 2 digit “cast number” embossed on the side, instead a series of numbers that are unidentifiable to me. The Mexican blocks were rumored to even be harder to machine do to a harder cast overall, basically better quality in my opinion. Brazilian Tupys always seem to outnumber Mexican blocks during the ISB’s production probably about 8 to 1. So basically if there is a pattern number its Brazilian, if there is a series of small numbers its Mexican. By the way the Mexican equivalent of a 56 pattern was the Heaviest ISB block of all. This means if you have a 2002 without a #56 on it and instead it has a series of numbers that are smaller and hard to identify, you got the the big boy!!! Simply, the worry is that the block will crack. 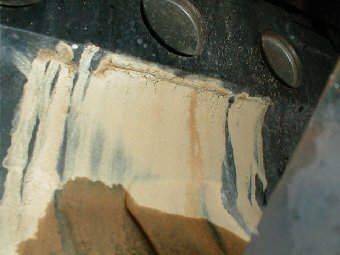 These blocks have thinner water jacket walls than other blocks so with coolant cavitation, corrosion, coolant pressure in the block, and torque, they may crack, spilling your coolant. I know from experience that it will not blow up the engine, but you will see that temp gauge rise more often than you’d like. 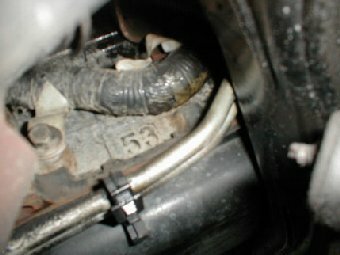 Those owners of a Cummins 24v ISB engine in a 1998-2001 model year vehicle. This does not only affect Dodge Rams. The 53 block was also used in medium duty trucks from different manufacturers, mobile homes, public school buses and mass transportation buses. Update: Recent information I have received from a 1998 12v owner says that some late 12v engines have “53” blocks. This owner knows because he HAS one. His truck has a build date of 11-97. He did say, however, that he has had no problems with his block, regularly pulling heavy trailers in the Rocky Mountains. Note: I have heard of some cases where the “53” is elsewhere on the block, but I have not been able to verify any other locations or see them. 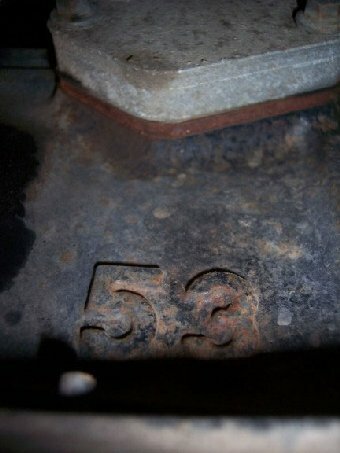 I now have proof of another location where a “53” can be found. See more information in photos and below. 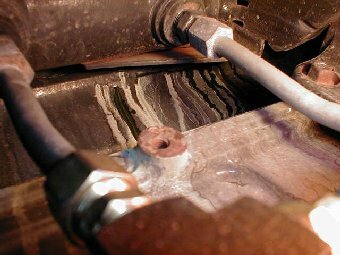 A crack develops on the right side of the engine, below the freeze plugs, right where the block bends back towards the inside of the block. 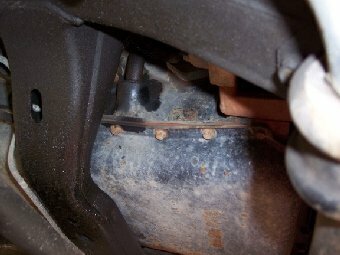 It is a difficult area to see for auto transmission owners as it is directly behind the transmission heat exchanger. At first everything evaporates so there is no spot under the truck, but you may notice a coolant odor. The leak doesn’t occur at idle in most cases because the crack is tight to get through, and doesn’t leak until the RPMs of the engine are up, with the water pump causing higher pressure inside the engine block due to the restriction of the thermostat. 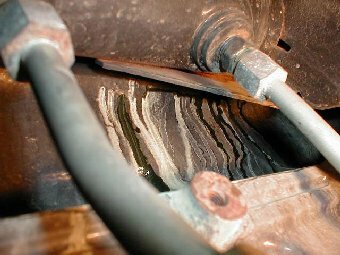 The crack will grow over time and you will go through coolant faster. I found that I lost coolant at a slower rate if I let the engine warm up for a while, so the thermostat opened and lessened the pressure inside the engine block. 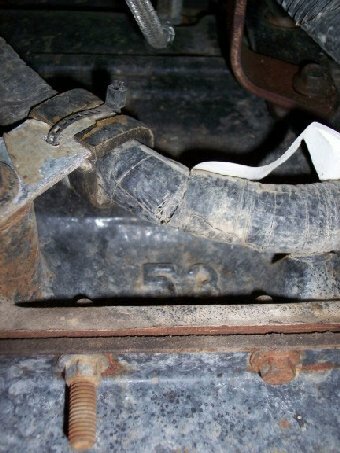 This crack begins when towing in most cases. I have seen modded trucks that did not leak until they were stressed from towing heavy loads in the mountains. These same trucks would put in several runs at the drag strip on a regular basis and never had a problem, even towing, until they towed in the mountains. This is how my crack happened. I towed my tractor on the basically flat land around my home (minimal rolling hills) and I had not experienced a problem until after I had towed my tractor in the Blue Ridge mountains of Virginia (for those of you who don’t know, these ain’t very big mountains when compared to the Rockies). The load was about 8,500 lbs + the 6,900 of the truck. What Do I Do If I Have A Cracked Block? This depends on a lot of things. In the first scenario, you have a stone-stock truck with less than 100K, and is less than 5 years old. In this case, just take it to the Dodge dealer and let them put a new short or long block in (they will decide which they put in), free of charge. If you don’t have any other problems with the internals of your engine you might ask them if they will just replace the block with the latest design ISB block, the “Storm” design. Reasons for this will become clearer later in this article. If you have no engine mods, but have added gauges or upgraded the transmission in a manner that is evident to the naked eye, you will likely get some flack from Dodge about your “mods”, even though they don’t really affect the engine’s running or what caused the crack. This happened to me, in that I have Fuel Pressure, EGT, and Boost gauges, as well as an upgraded transmission with a double-deep pan on it, and an Emjay transmission shift controller. 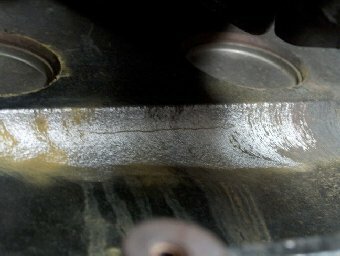 If you have a modded engine, depending on your mods, and how difficult they are to remove with no evidence left, you may have a fight on your hands. Remove everything you can, and be prepared to challenge everything they gripe about on it. The gauges do NOT have anything to do with the engine block cracking, and they know it. The dealer may try to tell you they have never seen a block crack. It’s a bold faced LIE! Unless the dealer just opened it’s doors or they don’t have Dodge trucks in that area, someone there knows all about it, and the Dodge regional rep who must inspect the engine to approve warranty service on the block, due to its cost, knows all about it. This frustrated me, as my dealer told me they never heard of such a thing happening to these engine blocks. While I never actually got a chance to speak to the regional rep, the dealer told me the rep said he had never seen an engine block crack. Another lie. The rep only wanted to pick my truck apart, and said the crack was cause by “over torque”. More BS. I will relate my experience and what I have heard, to get warranty service when Dodge tries to wiggle out from under it. I heard someone else say that they called Cummins to yell about it, and Cummins got Dodge to take care of it. This is actually what I ended up doing also. In my case, I took my truck to the Cummins dealer in my area, Mid-Atlantic Cummins, and a service writer there helped my with the warranty matters. My plan was to have my “aftermarket” warranty I purchased with the truck pay for the repair since Dodge rejected it. It turns out their “fine print” says they won’t pay for any block problems that aren’t “caused by an internally lubricated part”. That’s when I called Cummins about my problem and they got in touch with someone higher up at Dodge to take care of my warranty issue. Cummins number is 800-DIESELS. Other information I learned from Cummins (but you don’t know this if you have to call). The Cummins engine is actually purchased from Cummins by Dodge with no warranty, and Dodge honors all warranty on the engine. Block while the engine is in the truck, right after the leak started. You can see the transmission lines going into the heat exchanger. This will give you an idea of how difficult it is to see if you have an auto transmission. These pictures were taken once the engine was out and sitting on a stand. I have now confirmed 2 rumors as fact. The first being that “53” blocks were in trucks with a year model as late as 2001, and the second, that a “53” can appear on the right side of the block also, or instead. The following pictures were sent to me by the owner of a 2001 Ram with a “53” block in it. There are pictures of the right and left sides of the engine. Next, passenger side: You will see that the “53” appears directly below the oil filter mounting assembly, and directly in front of the front turbo drain port in the block (there are 2 on an ISB engine). In the first picture it is hard to see, but I wanted to get you an idea of where to look, hence the wide angle. There is a close-up in the next picture. Close-up of the right side. 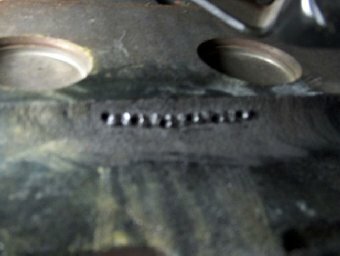 Another fine gentleman has been kind enough to send pictures of his repair, having been out of warranty due to mileage. His repair was done by a machine shop, and the machine shop guy took the pictures. Unfortunately he was better at block repair than photography. Due to this, some of the pictures you will see below are out of focus. Regardless, I am happy to have these pictures, in an effort to give you hope, if you are the owner of a “53” block. 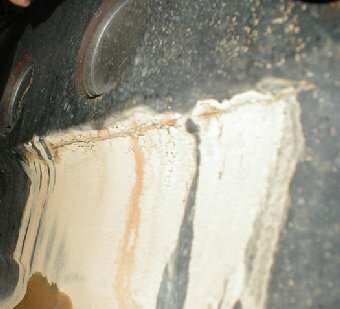 The crack, ground for preparation of the Lock-N-Stitch repair. 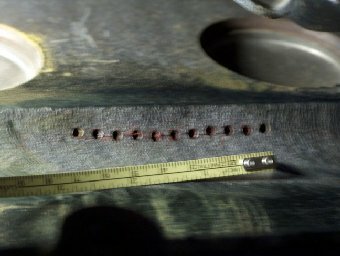 The holes drilled in the crack, with one on each end of the crack to prevent it from spreading. 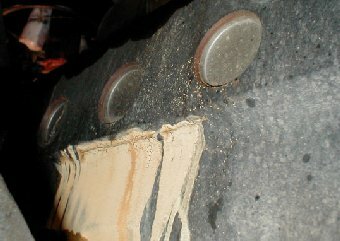 The crack after the Lock-N-Stitch inserts have been driven in. These overlap somehow, and are shaped in such a way as to draw the crack together as they are installed. I am very sorry these are out of focus. I will try to obtain more if I can reach someone else who has this procedure done. The finished repair, after magnafluxing, to verify the repair. You may be able to make out the overlapping with the yellow magnaflux lines in there. It is my understanding that Lock-N-Stitch has been applied to many cracked “53” blocks, but I have no hard numbers on it. As far as the durability of this fix, I am keeping in touch with the kind fellow who sent me these pictures to see how his “53” block holds up. If I hear anything negative I will post it. His repair was done in early February, 2005. The web site for Lock-N-Stitch. If you have any other questions about the 53 block, feel free to email me with your question. I will try to give you a good answer. If you have repaired your block, using any method, I would like to know how you did it, and how the repair is holding up over time. Please send info and pictures, if possible. I want to post the information here to help educate others. 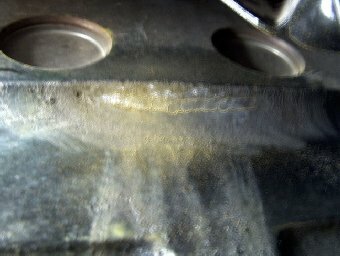 This entry was posted in Engine, Troubleshooting and tagged Dodge 24V Cummins (98.5-02), service. Bookmark the permalink. Both comments and trackbacks are currently closed.